There is much confusion about so many gods in Hinduism and Vedic Culture. Lets try to demystify it a little. Lets begin with who Devatas are. Devatas are demigods, or, angels in Hinduism and are also called Adityas. Aditya means "son of Aditi". Aditi is the mother of the Sun and the other devas, while her sister Diti was the mother of the asuras, or the demons. Diti's sons are also called Daityas. The other clarification I wanted to make through this blog was about the Hindu Trinity of Brahma, Vishnu, and Mahesh (Shiva). There is a general confusion for many people about the terms Brahma versus Brahmin versus Brahman. And this is but natural because they are spelled so similarly! Brahma is the creator of the material universe, he is born of Vishnu, and operates as per Vishnu's command. He is often depicted as an elderly bearded man with three heads, sitting on a lotus flower whose long stalk emerges from Vishnu's navel, almost like an umbilical cord. There is deep symbology behind all of this, beyond the scope of this discussion. This Brahma, the creator, occupies a post or "office", and his job is to create. He is not worshipped as the Ultimate Truth or The One; he is considered a "demi-god". Vishnu and Shiva are the ones who get to enjoy the title of "God" spelled with a capital "G", while other deities are "gods". These gods could be considered angels or divine officers, or divine beings who are highly evolved and have much power, yet they are not God. The title of God goes to Vishnu, Shiva and Shakti. Of course, staunch worshippers Vishnu (Vaishnavas) may disagree, and say that only Vishnu get the big "G". Shaivites (those who worship Shiva) may argue that only Shiva is God and Vishnu is a demigod. Those who exclusively worship the Divine Mother Shakti (Shaktas) will say, nope; there's only one God and She is Kali/Durga/Laxmi. But for most people in India, God means Vishnu/Shiva/Shakti when God takes on a PERSONAL (saguna) form. When God is IMPERSONAL (nirguna), He/She/It is incomprehensible, limitless, formless, genderless, ageless, beginingless, endless, boundless energy. Lord Krishna (God) talks about this in the Bhagavad Gita, particularly in chapters 10 and 11. He also states that those who worship the ancestors, the demigods, and other "lower" celestial beings will enjoy the planes of these divine beings and return to earth when their karma is exhausted, but those who worship GOD (Krishna) will attain Him alone and never have to re-enter the cycle of birth and death. Lord Krishna also says that whomever you choose to worship, your prayers ultimately reach Krishna. The demi-gods are personifications of the planets, the elements, rivers, mountains, forces of nature, etc. They are revered as very highly evolved beings far superior to man. They hold boons and blessings and they have the power to influence human destiny. They have their own stories, their own glories, their own mantras, special days of the week, rituals of worship, magnificent temples, magical vehicles, weapons, and other divine opulences. They are worshipped as manifestations of the endless wondrous powers of God. However, there is a clear understanding in the mind of each Hindu that God is One, Many are the Manifestations. This is a central tenet of the religion. I imagine that this is similar to the concept of Patron Saints in Catholicism. These are powerful and revered beings to whom prayers are made, but ultimately God is One. In fact, doubting His singularity in Christianity would be blasphemy. Similarly, Hinduism is very much a monotheistic philosophy; but seemingly polytheistic, with millions of deities who preside over the forces of nature, like stationed officers, under the command of The One. You could also look at them as expansions of God. In the beginning there was One. In the Vedas, the sentence "Eko'ham, bahu syam", when translated means, "I am one; let Me be many". Thus God became everything and everyone--all of creation. This is why we look upon everyone as divine; as carrying a spark of God, which is the soul or atman. When God resides in us, how can we be doomed sinners? When God/Atman resides in all other creatures around us, how can we kill and eat them? This is why vegetarianism is such a cultural concept in all Dharma religions. This is why cows and other animals are "worshipped" in India, much to the amusement and laughter of the rest of the world, who is exposed to such practices on documentaries which do not explain this cultural context. Without understanding this backstory, India is misunderstood as a backward country, and Hinduism as a religion of simpletons. Now, lets move on to Brahmin and Brahman. Brahmin is simply a man or woman whose occupation is scholarly or priestly. Brahman is synonymous the The One, or the Supreme, or God. Brahma, Brahmin and Brahman are the usual romanized spellings of these three words. But if I were to write them out in IAST format with diacritical marks, they would look like this : (1) ब्रह्मा brahmā ,the creator god (2) ब्राह्मण brāhmaṇa , the priest, and , (3) ब्रह्मन् brahman, The Supreme. The diacritical marks help us with the proper pronunciation. Is Ayurveda going mainstream like Yoga? Ayurveda is becoming more recognized in the United States, but it will not experience the same mainstream popularity that Yoga has experienced. 1. Yoga is big business. Yoga has experienced mainstream success thanks to the commercialization of it. From busy city corners to quiet main streets, Yoga studios have popped up all over. Yoga mats can be found from stores like Whole Foods to TJMaxx. Yoga clothing maintained popularity with the fashion trend, Athleisure. Yoga is lucrative. 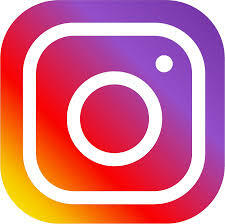 A hashtag search on Instagram shows #Yoga with 23,865,442 tags. #Ayurveda has 244,359 tags. In order for Ayurveda to experience mainstream success, it needs to be incorporated into business models that are both profitable and scalable. Without a trusted practitioner or expert of Ayurveda guiding the way, navigating Ayurveda as a novice is confusing. Information online is copious. It is difficult to wade through the sea of website documentation, while verifying authenticity and understanding enough of the subject matter in order to confidently apply it to one’s own medical condition. Medical-related inquires and online search do not yield helpful results. On Twitter, Comedian Bill Murray said it best. Ayurvedic herbs or beauty rituals may experience short term popularity because they are easy to understand and to apply to one’s lifestyle, but the importance of Ayurveda as a holistic health modality is much more multifaceted. If western medicine were to challenge Ayurveda to a boxing match, western medicine would deliver a knockout punch in the first round. The public trusts western medicine’s ability to deliver immediate results. Side effects of “get-healed- fast” are downplayed or prescribed with additional pills. Deepak Chopra and others have taken great steps in communicating the health benefits of Ayurveda in the US, but only the tip of this iceberg is showing. There is a seismic shift toward whole body health with more focus on traditional ways of healing in the US. NAMA (The National Ayurvedic Medical Association) is focused on enforcing stricter regulations for those who wish to practice Ayurveda, with board examinations and license examination beginning December 1st, 2016. While Ayurveda will not experience the same mainstream popularity that Yoga has experienced, I believe Ayurveda will enjoy a slow and thoughtful growth, where the ancient wisdom of Ayurveda is respected, learned, shared, and practiced in today’s modern world. In the last decade, especially with studies on casein, and, many people developing sensitivity to Lactose, a sugar found within milk, or, problems digesting milk proteins; milk has developed a bad reputation in United States. I get asked constantly in my Herb class, if Almond milk, or, soymilk is okay to substitute for dairy when using as an anupana for delivery of herb. The answer is NO. It is not the Ayurvedic way. When I am talking about using milk as an anupana (a vehicle that increases the efficacy of the herb, and, delivers it deeper into the dhatus, increases kapha, decreases vata and pitta) then only actual dairy will do. This usually means cows milk. By the way, how can a nut milk be milk? By definition, a milk is produced from a mammary gland? And, if god didn't attend humans to drink milk then he/she wouldn't have provided those to the feminine gender, I think! Ayurvedic texts like Bhavaprakasha mention benefits of milk not just from cows, but, also from sheep, camel, buffalo and goat to name a few. Another question I get constantly asked is do we like milk raw or boiled? Answer is boiled. Pasteurized. But--how??? Ayurveda is all natural? How can it not advocate raw milk. Because, my dear, raw milk can give rise to diseases. It can carry DANGEROUS bacteria. Ayurveda does not like bacteria and krimi. Our ancient seers talked about boiling milk when everyone had a cow in their backyard, everyday and once a day. In ancient times, we got rid of bacteria, and, all kinds of krimi by constantly boiling our water, milk, and, all fluids. I grew up in our household boiling our milk every single day, sometimes twice a day (If it was too hot, as we didnt have refrigeration). First lets understand what is the difference between different types of pasteurizing and boiling? Flash pasteurization- High temperature 162 Fahrenheit for 15 seconds. Okay in Ayurveda, in my humble opinion. Boiling the milk for some seconds is advised in Ayurveda. Just not ultra pasteurized. We boil herbs like Ashwagandha in milk. We add turmeric or poppy seeds, or nutmeg to this boiled milk. We add saffron. We drink it with herbs. We even boil water that is already sterile in Ayurveda. Boiling water causes the agni, or, fire element to be present and changes the energetics of the water to a lighter and easily digestible. Local, Grass fed organic milk pasteurized milk is the best I found in California, and, now in Austin. And, these fat particles are broken up so they mix with the rest of the milk - so no cream would be formed. Ultra pasteurized means it is first pasteruized, then pasteurized again to make it ultra sterile and that kills off the nutrients. Then, Vitamin D (Read Fish oil) are added. This is why we use this milk from California that is lightly pasteurized, you see the cream floating on the top and it has not been altered by changing chemical structure. One of the questions we get asked a lot, is how can Ayurveda colleges offer Ayurvedic Medicine certifications online, or, via distant learning? Does this mean our Ayurvedic Studies will not be interactive? How shall we learn under a qualified Ayurvedic Practitioner online? How will we learn nadi pariksha? How do we achieve this? Live lectures that students can attend from their mobile android, or apple device. Or, through their computer. These sessions may be recorded, and, are available to watch on a computer for one week. Screenshot attached. After a lecture, teachers will usually ask the students to start a forum discussion on certain topics on our online learning system we call WORKSPACE. Students login and post forum discussions, read discussions from other students. Forum posts follow certain rules--and are on specific topics. This is all done at an OFFLINE time at the workspace. Screenshot of a forum discussion shown here. c) Onsite Workshops- Every few months there are workshops in Austin Tx than can be four hours in length to four days in length. Shorter study programs, lectures may be offerred at San Diego, CA, Oakland, CA, Houston TX, Dallas, TX and Tampa, FL provided we have at least four students confirmed. Many onsite workshops have dedicated time, where, students learn directly under Ayurvedic Practitioner. This includes Ayurvedic Cooking Demonstrations, learning how to prepare Ayurvedic Herb mixes, and, learning nadi or pulse pariksha. e)Distant learning or home learning- All the student readings, student homework pertaining to research, memorizing, and, learning is considered home learning or distant learning. All the time spent on workspace downloading, going through material is also distant learning. 1. Visual Learners- Visuals, DVD, Archived Youtube videos, Charts, Powerpoint Presentations online and Study Aids used for Visual Learners online, and, sent to the student while pursuing their Ayurvedic Studies. 2. Auditory Learners- Those who like to listen, you will hear, and, get a chance to ask questions at our live virtual classes. Many Pre recorded lectures available on youtube and at our workspace. 3. Hands on learners- Come to the workshop onsite and you will get plenty of Hands on experience. Ayurvedic Nutrition is easy and simple, yet, quite complicated. Unless you are well, and, quite healty, it is not possible to just read a book and start using recipes indicated for your dosha-Vata, Pitta or Kapha. For those who are unwell, suffering from vitiated agni (digestive fire), or other dosha related imbalances, it is advised you visit an Ayurvedic Practitioner. Rasa-There are six tastes. Ones food and diet must have all the six tastes when one is well. When unwell, it is suggested to focus on the rasas, or, tastes suggested for your dosha. For example, for pitta and high heat sweet (naturally), bitter and astringent (green beans, plantain) are suggested. Sattva, Tamas, or Rajas-Affect on the mind. Ojas- If the food item supports ojas or bodys natural immunity. San Diego College of Ayurveda offers online courses in Ayurvedic Nutrition, Ayurveda Counselor and Yoga Teacher Training. Ayurveda is a 5000-year-old science and throughout the course of time there has been little or no change in the practiced form. While it can be said the overall principles of Ayurveda is timeless; the reality is that today’s society demands modern treatments which combine both science and technology to not only assess and understand the body, but to treat diseases as well. As scientists continue to discover and analyze diseases, modern technology allows them to determine the root cause down to the DNA level. In turn, this allows the research and development of modern drugs to also be done at the molecular level. This allows for a very comprehensive and dynamic understanding of cause and effect of pharmaceuticals on the body as well as the disease. Unfortunately, while this may be beneficial in the treatment and cure of some diseases, from an Ayurvedic perspective, it does not take into consideration the concept of the fundamental principles. If the fundamental principles were proactively considered as function for optimal health and maintaining the balance and harmony of the tridoshas, disease may be prevented altogether. While technology does offer some benefits, it is not without its faults. Just as technology creates opportunity for cures, it also fabricates new disorders. A primary example would be diseases resulting from GMOs. Food that has been genetically altered at the gene level is not compatible with the body at the genetic and cellular level thus resulting in new disorders. It can then be argued that Ayurveda, while “old-fashioned” in nature is based on clean, organic foods that the body can naturally metabolize as intended via the fundamental principles. Without dramatic lifestyle changes, a few Ayurvedic best practices -example DAILY ROUTINE PRACTICES can help improve overall health. In fact, while at the root of Ayurvedia, many of these are well known best practices that are suggested time and time again.  Eat your largest meal midday. This is when Agni is at its peak.  Choose whole foods and make sure your meals have a rainbow of colors. This variety of colors will help ensure you use the six tastes in every meal and lead to overall satisfaction.  Don’t eat while overly emotional. This can lead to poor diet choices as well as poor digestion.  Practice mindful meditation. This includes anything from breath awareness to yoga as it helps to reduce cortisol levels which relates to a reduction in stress and weight gain both which if not kept at bay results in illness. A little you time never hurt anyone.  Get enough sleep. This is when the body repairs and heals itself and the mind and emotions become balanced. Simple practices that yield a lifetime of benefits. Despite the 5000+ year roots of Ayurveda in ancient religious traditions of India, the interest in this holistic medicine did not expand in the United States until the 1970’s. Adoption of Ayurveda in the United States has been slow going due to the differences in holistic versus allopathic medicine approaches. As a result, traditional western medicine has contrasted with Ayurvedic beliefs linked to treating the being at multiple levels, not solely the physical body. In the United States, the mind and spirit are missing from approach to treating illness and disease. Over the past 40 years, adoption of Ayurveda in the United States has been faced with challenges. The present challenges of Ayurveda include globalization and industrialization of drugs, and the quality assurance in the use of drugs. Traces of lead, mercury and arsenic have been found in over-the-counter medicine manufactured in South Asia (Ref: National Institute for Ayurvedic Medicine.) In addition, it is believed further research, testing and validation is needed to expand upon the Pramana Vijnan Ayurvedic principles and philosophies. The World Health Organization has studied the uses of Ayurveda and herbal medicine in India. Due to regulatory challenges, the WHO has suggested a plan for countries to standardize national traditional medicine polies and programs. Although Ayurveda is faced with some challenges, there is billions of American’s spending money on alternative medical treatments. The emphasis on holistic medicine is increasing as side effects and outcomes of allopathic medicine become understood. A shift away from treating the disease to preventative and pre-symptoms are now being taken into account. Spirituality, beliefs, values, diet and lifestyle are all very important components of health and well-being. Best practices of Ayurvedic medicines include sophisticated therapeutic formulations and detailed guidance about food/nutrition/diet (EPMA, 2014). Although the present challenges to adoption of Ayurveda has impacted the speed of adoption, I believe the growing need for Ayurveda as a healthcare approach which incorporates religious and spiritual demands, will force scientists and healthcare professionals to study and practice Ayurveda. Patients are becoming more informed about the medical approaches available to them. As a result, this will only continue to reinforce the best practices and benefits of Ayurveda. I am choosing to discuss challenges and best practices in Ayurveda in the US. I have to admit that i am very much a student of the discipline and am not sure if best practices have been defined. I know in western medicine, the term best practice is often used rather loosely as their can be differing opinions on what "best practice" actually is. Sometimes, there are evidence based or consensus based recommendations from experts in that niche area. I think that one of the greatest challenges is that Ayurveda it does not benefit any special interest groups or organizations. Because of this, there will always be limited funds to conduct intense scientific based research which is often needed to be recognized in this country. As we all know, there is research funded by the government and public organizations but much of the research being done is still funded by the pharmaceutical industry. Of course, if Ayurveda can prove that integrating its use can decrease morbidity and cost insurance companies less money, there is a chance it may be recognized and paid for. These may be recognized by Accountable Care Organizations as well if Ayurveda can prove that integrating this practice into the lives of the population cared for can decrease hospitalizations and overall costs. With a focus on true wellness, this may be a possibility but we have to recognize that many will not be open to this discipline anytime soon so we will need to focus on improving the outcomes of those who are. Until this is recognized by Medicare, Medicaid, and private payers, Ayurveda will need to focus on those willing to go outside of their insurance company. Western Nutrition label focuses on Carbohydrates, Proteins, Fats, Vitamin A, Vitamin C, Iron, number of calories etc. 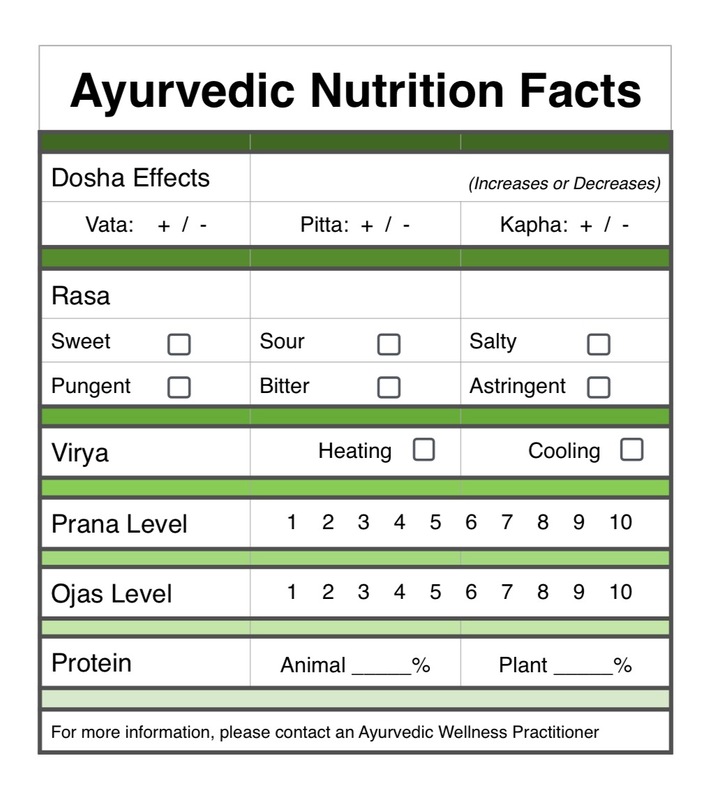 Dr Monica Groover and a student who was a registered dietician thought of a fun way to actually explain Ayurvedic Ahara (nutrition) to students by asking them to illustrate what they thought an Ayurvedic Nutrition Label would look like. Here is a great example by Surekha Koya, Block 2 counselor student. In our Block 1 (level 1) Tracks, we start out by introducing the concept of Prana. One of the most fun and interactive activities that students love is the comparison and creation of an Ayurvedic Myplate. 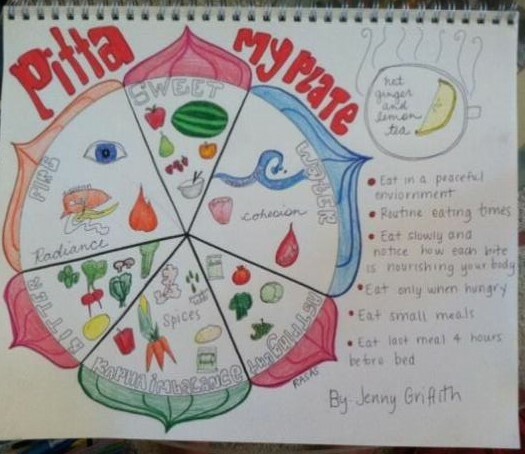 After going through the foundations of Mahabhutas, and, twenty gunas--as well as the six tastes(rasas)-we do this fun activity of taking the myplate.guv and trying to add some Ayurvedic element to it. 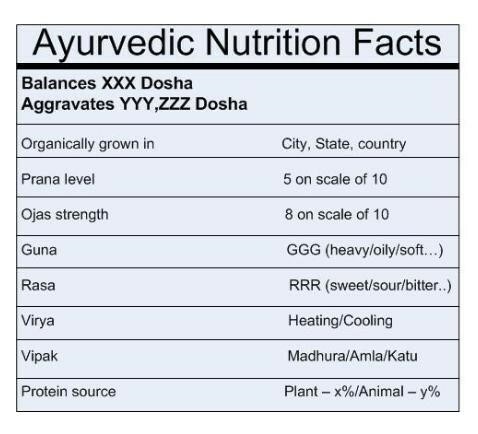 This is an example of a student Ayurvedic Myplate for a pitta predominant Vikrti (imbalance) with low tejas, who was a stretched thin. The My Plate for Pitta should include food that is as local, and, fresh as possible. This means minimizing or eliminating processed foods, frozen foods, canned foods, and foods containing preservatives, salts, fermentation additives, alcohol and vinegar. In addition, it includes minimizing the use of leftovers. Food should be organic and locally grown when possible as well. Essentially, as my pitta is high, I need to minimize any rasa’s (tastes) that contain the fire element which is salty (fire and water), sour (fire and earth), and pungent (fire and air). Salty items include seaweed, saltwater fish, celery, natural minerals, salted nuts and sea vegetables. Sour items include citrus, yogurt, and fermented items. Pungent items include peppers, alcohol, onions and garlic. These have their place in small amounts, when in balance, but should be minimized if pitta is to be balanced. Items that need to contribute to the majority of the myplate for my pitta imbalance are items that are naturally whole and sweet which are whole grains, organic milk, and berries and fruits that are non acidic; bitter which are dark leafy greens and some herbs and spices; and astrigent which are legumes and some raw fruits/vegetables. There is no set amount of calories on this my plate. It is most important to honor your body’s needs and eat when you are hungry and to separate time between meals so the food can digest. Since this is a pitta my plate, it is good to have a set schedule where meals will be consumed which honors the pitta dosha. Today we will talk about organic, local foods. Ayurveda propogates fresh, local and Organic, plus, it should be compatible with the dosha, the season, the country and terrain we live in and our age and strength. Whew! Its a long list. How can we hope to remember this. Lets just focus on Prana in the Food. Prana is the vitality of the food. One of my students asked me recently, "My question pertains to fruit that is organic, from a local farm, picked at the height of ripeness, but then frozen (but without any additives or preservatives). In the West, I have often heard that frozen fruits and vegetables can be more nutritious than fresh, because they are picked when they are ripe, and then flash frozen which retains most of the nutrients." My student asked this question after our class, in which we talk about frozen food being depleted of prana. How does a fresh fresh picked organic strawberry from a field--taste? It has the following rasas--sweet, astringent, a little sour--and it is juicy and full of PRANA and vitality. How can a frozen strawberry have the same energetics as a frozen one? (Even if organic). Answer is no--it cant. If it is not how nature intended, and, it tastes different--how can prana be intact. Take an example of a squirrel that died in winter--and it snowed. The squirrel's body was perfectly preserved along with nutrients, proteins in the very cold snow for the entire winter. When the snow melted--squirrel was PRESERVED--but it was a DEAD BODY!!!! Frozen, canned, tinned---is food that has died. It is dead. It has no prana from an Ayurvedic perpsective...yes, it has nutrients-some of it. There are some seeds that will retain prana when frozen--but they are few and far in between. It is always better to eat something local--even if not organic--then organic, frozen that has travelled from a long time. However, we are bound by time, convenience, cost and availability depending on where we live. 2. Second best--foods that can be stored--in winter in very cold places. Sundried organic foods, organic seeds, organic nuts, legumes. Whole grains (not ground into a flour) can stay for a longer time and will retain maximum prana. Better to eat fresh food, plants, veggies and fruits that are not organic, but LOCAL--compared to fresh food that is frozen and organic. Or, local dried fruits and vegetables--can be used in soups--if fresh vegetables not available. Mix and match--depending on your budget and availability. More to come on...GMO FOODS and Ayurveda.